In the first part of our series called, “What is telemedicine,” we focused on the three types of technologies that enable it; store-and-forward, remote patient monitoring, and real-time telemedicine. Today we want to talk more about some of the ways that telemedicine is used to extend the delivery of care to patients in new and innovative ways. Video based visits with primary care physicians are convenient and cost effective for patients and they help the provider develop patient loyalty in an increasingly complex competitive landscape. In terms of primary care, telemedicine is most commonly used for follow-up visits, medication management, and lifestyle coaching. Both stand-alone urgent care centers and primary practices are embracing telemedicine for remote urgent care appointments. The option decreases the complexity of getting treatment for sudden onset illnesses or injuries and helps reduce unnecessary visits to the emergency room. Specialists often treat patients with complicated, long-term chronic illnesses. Telemedicine is ideal for helping gastroenterologists, OBGYNs, rheumatologists, dermatologists, neurologists, and other specialty providers work closely with patients to manage their health. The technology also makes it possible for providers with highly specialized skills and experiences to service a larger geography. In 2030, older adults will comprise about 20% of the US population. Providing adequate care for our aging population efficiently and cost effectively will be essential in the next several decades. 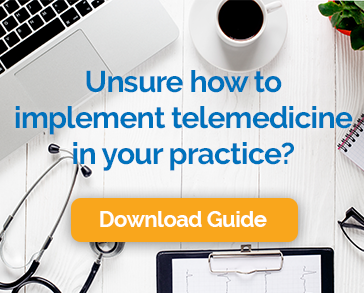 Telemedicine technology allows providers and patients to connect remotely for follow up visits, medication supervision and chronic disease management. For patients who no longer drive, or those who reside in assisted living centers, telemedicine makes it easier to attend all recommended visits, improving the chances that the patient will comply with the provider’s recommendations. What’s good for our seniors is also good for our children. When children become ill at school, they might visit a school nurse or be picked up by their parents and taken to an urgent care center. As an alternative to this disruptive approach, some districts have teamed up with doctors to conduct remote visits from the school. The provider can assess the urgency of the case and provide instructions or reassurance to parents. In addition to expanding the options for traditional providers, telemedicine has opened the door to a new online only type of service. Patients are connected with physicians who diagnose and treat a variety of conditions over the internet. The patient does not establish a relationship with a particular provider, but rather uses the service as needed, on-demand. Most people see this as a supplement to, not a replacement for primary care. As you can see, the possibilities for the practical application of telemedicine are vast. It is now an important part of the American healthcare system and no longer a novelty. This is great news for patients and providers alike.